Despite their name, heat pumps can actually be used year-round. 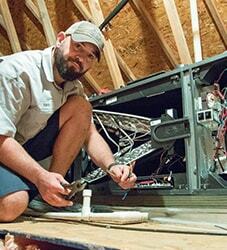 The expert technicians at Robert B. Payne, Inc. pride themselves on their professional knowledge of the many HVAC options available to the Fredericksburg area. No matter what your home or business is like or what kind of budget you are working with, we make it our mission to find you the perfect heating and cooling option. Not only that, but we are also committed to making sure that you get as much use out of your products with our professional maintenance and repair services. In the wintertime, a heat pump works by siphoning heat from the exterior air and circulating it through the ductwork into your home or commercial property. In the summertime, they work by drawing heat from inside of your home or business and circulating it outside. One of the best ways to make an educated decision about which type of pump is best for you is to become knowledgeable about the different kinds of heat pumps there are to choose from. 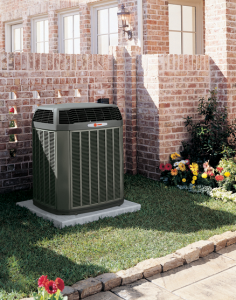 One of our highlight products is the Trane Heat Pump. The advantage of Trane pumps is that they are available for every price range. The Trane TruComfort heat pump runs at the precise speed that you need to keep your business or home comfortable. The XL15i is one of the most energy efficient pumps and also has one of the lowest sound levels that you will find. The Trane XB14 is built to last and also has advanced air filtration for removing common air irritants, like pollen and dust. A heat pump is capable of replacing both your furnace and air conditioning central air, making it quite efficient and cost-effective. To many people, a heat pump is a worthy investment in the home. On average, the cost to install a new heat pump is anywhere from $3,000 to $7,000. The total cost will depend on the size of the unit, the size of your home, the type of heat pump you want installed, the length of the job, and the number of technicians working on the installation process. The higher the capacity of the heat pump, the more you will pay for the installation. You should never try to cut corners or costs by installing a heat pump that is smaller than your needs; this can be a costly mistake. 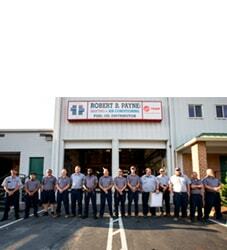 At Robert B Payne, we offer affordable prices for all of our installation processes. You are guaranteed to receive a price worthy of the investment you make in your heating system. Making the choice to install a heat pump is one that really could save you money in the long run. Here’s the thing: when it comes to heating and cooling your home, heat pumps are incredibly efficient. Heat pumps don’t simply manufacture the heat that they’re producing. Rather, they collect air from outside your home and then transfer that air indoors. Heat pumps do a fantastic job of providing you with a high level of comfort, thanks to their continuous air flow (as opposed to, say, a furnace). In short, the efficiency of a heat pump is truly hard to beat. 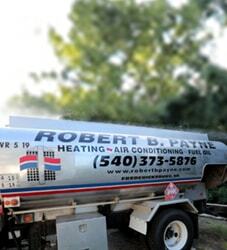 If you have further questions about heat pump efficiency, it’s time to call Robert B. Payne, Inc. today! How do I know if my heat pump is working properly? If properly installed, your heat pump will channel air throughout the entire home while heating the building, depending on if your thermostat is set correctly to ‘heat’ or not. The heat pump is quite a complicated bit of machinery, though, and many home and business owners are unsure whether or not their system is working as it should. The most common signs of a working heat pump is how quiet the system is. The main way to tell if your system is working as intended is to simply listen to the unit running. You can hear the system when it turns on, when the fans begin to work and stop, and when air passes through the ducts. Other than that, the unit itself should be quiet, without any groaning or creaking sounds. Your motor, the biggest telltale sign of something wrong, will sound efficient. Many homes throughout the region have installed a heat pump to keep their heating system running smoothly throughout the entire house. There are numerous benefits to using a heat pump. For example, they are safer than a heating system that utilizes combustion, they tend to be quite a bit cheaper to operate when compared to oil or gas boilers, and they have been known to reduce carbon emissions drastically. Additionally, heat pumps require less maintenance and have a long lifespan. These final two factors are major considerations for any homeowner looking to make the investment in their home’s heating system. When installed correctly by a professional, the heat pump can last you for up to five decades. Simply take care of the system and utilize it to its fullest to enjoy all of the benefits a heat pump can offer you. What kind of warranty can I expect with a heat pump system? A variety of warranties are available when you purchase a brand new heat pump system for your home. The most basic warranty is the base limited warranty directly from the manufacturer, which covers the equipment from the time it leaves the factory to a short period of time after installation. Usually, however, you must register your product via the official website of the manufacturer in order to take full advantage of their offered warranties. Some individuals may choose to expand their warranty, though it may cost you a bit more in the initial purchase to have an extended warranty. With careful maintenance and a cleaning schedule, an extended warranty may be nice but not always required. Of course, the choice is always up to you. If you feel the warranty could benefit you and your home’s needs, then by all means choose to receive it. There are three different types of heat pumps available on the market: air-to-air, water source, and geothermal. The most common type is currently an air-to-air, or air source, heat pump, which transfers the heated air from your home and the outside to efficiently heat the entire household. An air source heat pump is generally considered most effective in an area with a moderate climate. The heat pump is fitted to the side of the building to draw in the air from outdoors and pump it inside after compression and coils heat it. A geothermal heat pump, or ground source heat pump, is a central unit that pulls heat from the ground and spreads it through the home. Finally, a water source heat pump will connect to your water supply and heat the water before distributing the heat through each room. For more information about heat pumps, or if you are interested in any of our other professional HVAC services, pick up the phone and call Robert B. Payne, Inc. at (540) 373-5876.